Anyone thats known me for a few years will know that I’ve recently lost quite a bit of weight. From Sept 07 until around Mar 09 I lost just under 6 stones. The weight has been pretty constant since then, if anything starting to creep back on. Crap. Now when I say creep back on, I really mean a couple of kilo’s over the space of 18 months. When I say a couple, I mean 5-6 kg’s. Crapper. This wasn’t part of the plan. I wanted to get down to under 90kg’s, which while still heavy would be a great weight for me and something I’d be deliriously happy with. But this year has seen me go from 92kg at Christmas to around 98kg a few weeks ago. 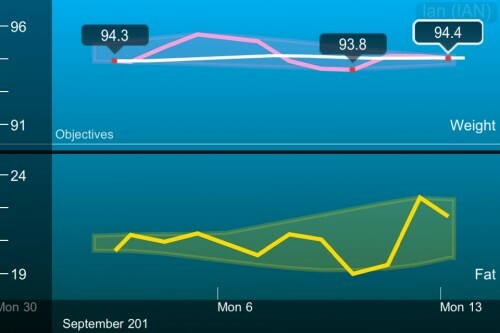 I then started feeling sorry for myself, and also fell into the usual trap….these scales are wrong. Even as I write that I feel embarrassed. However, there was no need – they were wrong! A sneaky weigh in on another couple of scales proved me right. I swapped over the batteries and it made no difference. So there you go – I need a new set of scales which was the perfect excuse to order the Withings scale – the first wifi body scale. I’d been itching to get it since I first heard about Withings at the turn of the year but the main reason had always been the fact I had a perfectly good set os scales already. Also they cost a pretty penny – I paid £107 including shipping. Ouch. I’ve now been using them for over a week and it really is a lovely gadget. So as scales go, they look good but the really nice feature is that they are wifi enabled, automatically uploading your weight, fatty mass and BMI to the Withings website. The weight tracking works for up to eight people from one set of scales so your whole family should be covered. The website is Flash based and lets you track your weight and add notes when certain events (curry!) have impacted on your weight. So far, so good. There’s also a free iPhone and iPad app that allows you to track your weight from the comfort of your iOS device. These are pretty straightforward but give you everything you need to know. 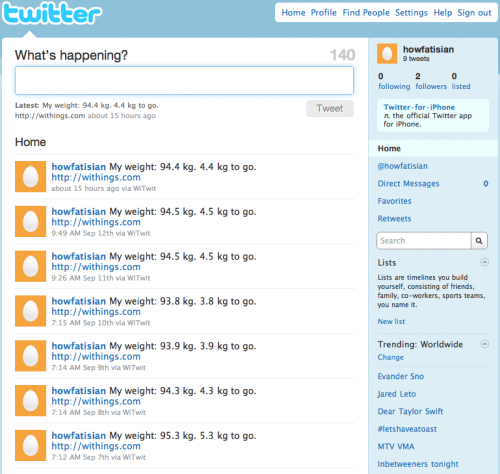 It had to be done – a new twitter account has been setup just for my weight. Special. I’ve also hooked Withings into RunKeeper. I track all my hill walks on RunKeeper and also now track my efforts on the bike. Having all that info in one place plus the weight is really nice. Also, I’ve paid for one years access to RunKeeper elite which gives me more detailed graphs, stats etc. The final piece of the jigsaw is to now track calorie intake. Couple of iPhone app’s are worth considering and I had myfitnesspal.com recommended so I’ll give those a try. The up shot of all that is that I’m a couple of kilo’s heavier than a year ago which isn’t too bad as I’ve not been doing the same amount on the bike. I’ll be stepping that up between now and Christmas so hopefully I’ll lose a little in the next couple of months – not long until Santa’s here now. As for Withings – great gadget, expensive and a bit over the top but I love it. Ian – Its official you are the biggest geek on the net. BTW I also use a laptop for work and also dual screen. PS. I also have two keyboards – bet they are better than yours!